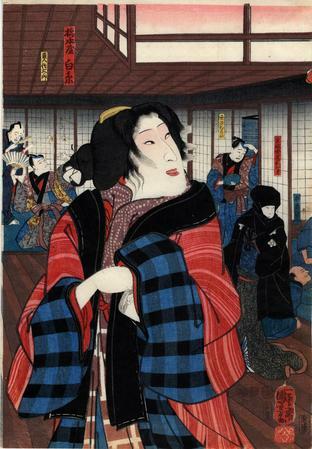 This print commemorates a scene from the play Sumidagawa tsui no kagamon (隅田川対高賀紋) performed in 2/1852 at the Nakamura (or Ichimura) Theater in Edo. Note the Western style perspective. "By far the most popular kudoki was 'Suzuki Mondo,' the story of a faineant samurai who squanders all his money on the geisha Shiraito, thereby bringing about the ruin of his house and family... The incident on which the story is based may have occurred in Edo in 1801, although some scholars believe that Shiraito may not have existed at all." Quoted from: The Autobiography of Takahashi Chikuzan: Adventures of a Tsugaru-jamisen Musician, p. xi. Kabuki21 defines kudoki (口説き) as "highly dramatic scene in which an onnagata actor depicts a woman's sighs, tears, love, passion or regrets for the past. Somehow the equivalent of an aria for Kabuki female roles." The figure in the background in the black cape with hood may be Suzuki Mondo's wife in disguise as a man. She has come to confront and possibly try to kill Shiraito. This is based on the information provided from a Yoshitoshi diptych of this scene.